The Odroid U3 is a powerful and compact linux computer powered by the Samsung Exynos Prime Cortex-A9 Quad Core processor. The board’s low cost and impressive specifications make it a perfect platform for embedded devices with significant computational needs. I’m using the board as part of the logic system in an autonomous marine surface vehicle, and needed low-cost solution for remote data transmission. For my purposes, the vehicle will not likely need to transmit or receive data outside of the range of a typical cell connection, so GPRS struck a perfect balance between transmission range and cost-effectiveness. The SIM 908 is a quad-band GSM/GPRS module with integrated GPS. This module was a great fit for my project, but unfortunately no guides existed for integrating the module with the Odroid U3. This guide aims to fill this void, and can serve as a reference for those hoping to integrate the SIM 908 module with other Exynos / Snapdragon based embedded computers. For this guide, I’m using the Adafruit Fona SIM 908 breakout board, and an Odroid U3 running Arch linux. Run sh sim908.sh in a terminal window. The easiest way to enable cellular connectivity on a Linux device is to use PPP, a Linux implementation of the point-to-point protocol. Using PPP requires creating both a PPPD configuration file, as well as a GPRS chat script. PPPD configurations specify the behaviors and settings required for establishing a network connection. These configurations should be stored in the peer connection directory /etc/ppp/peers/. The name of the configuration file will serve as the connection’s provider name. # Example PPPD configuration for SIM908 on Archlinux-ARM. # I'm connecting via Ting's 2G cellular plan for IOT, which uses the APN "wholesale"
connect "/usr/sbin/chat -v -f /etc/chatscripts/gprs -T wholesale"
# The Odroid U3's UART port is part of GPIO #1, and named "ttySAC0"
# Baud rate of the serial line. I'm using 9600, but it can be increased as needed. 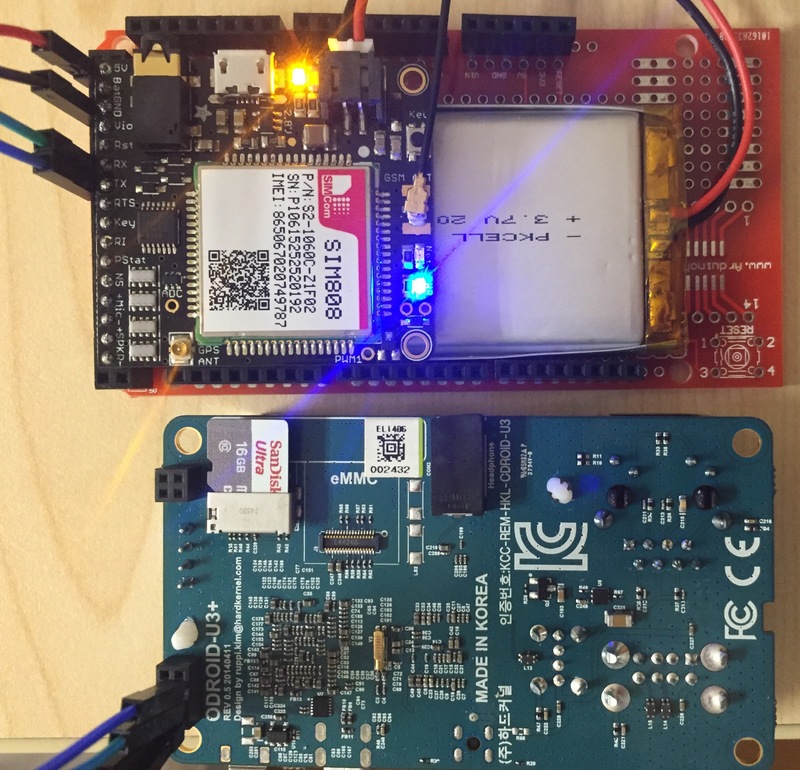 The GPRS chat script will dialogue with the modem and includes scripts to provide a SIM code and connection behaviors. This script should be saved in the chat scripts directory, with the name gprs, /etc/chatscripts/gprs. # Abort attempt to connect if the modem is not yet attached to the network. # Use +CPIN if you need to provide the SIM card PIN example uses code 1234. The Odroid U3’s UART port is pre-configured by default. A pinout and further details of GPIO #1 can be found here. To connect the Odroid U3 with the Fona SIM908 module, it’s best to first make a few connections between pins on the module itself. 5V > VIO - Connects the 5V pin (used to charge lipoly battery) with V in, to allow for one 5V source to power the board and charge the battery. GND > KEY - Connect KEY to GND to keep the SIM 908 on when under power. To test the hardware connection, run chat -t 5 -vs '' 'AT' 'OK' > /dev/ttySAC0 < /dev/ttySAC0. This command starts a communication with the modem. If there is not an ‘OK’ response, there is likely a wiring issue. Use tail -f /var/log/syslog | grep chat to monitor logs of the serial connection. Use tail -f /var/log/syslog | grep pppd to monitor the PPPDs logs.